Can you feel Autumn knocking at the door? Having a couple really cool days last weekend got me in the mood for Autumn days ahead. 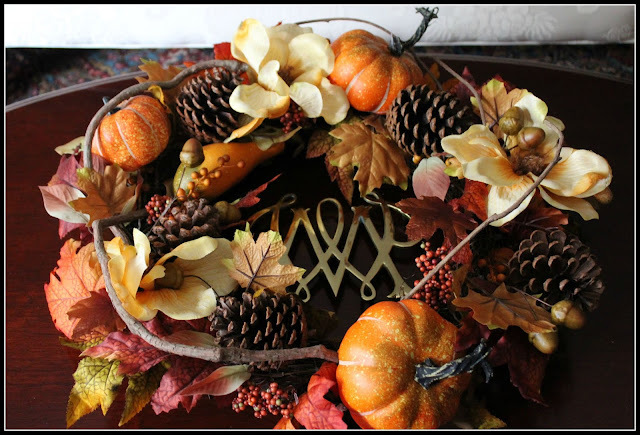 Even though the humidity has returned, a few fall wreaths are arranged around our home and not just on the doors. Autumn is my very favorite time of the year. After the summer heat and humidity my Autumn soul is ready for a respite. The leaves are falling from the old oak out front. Probably from exhaustion as much as anything. 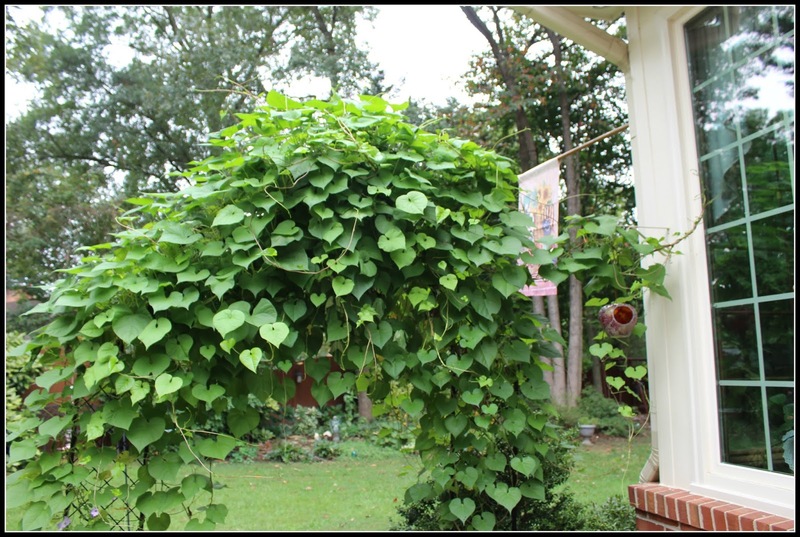 Most of our trees have a ways to go before we see the lovely changing of the leaves. We need much cooler days and nights for that to occur. I picked a few black gum leaves that always seem to be the first to show their color. Lovely shades of orange and red leathery leaves are bought inside to fill the dough bowl with seasonal finds and dried hydrangea blossoms. 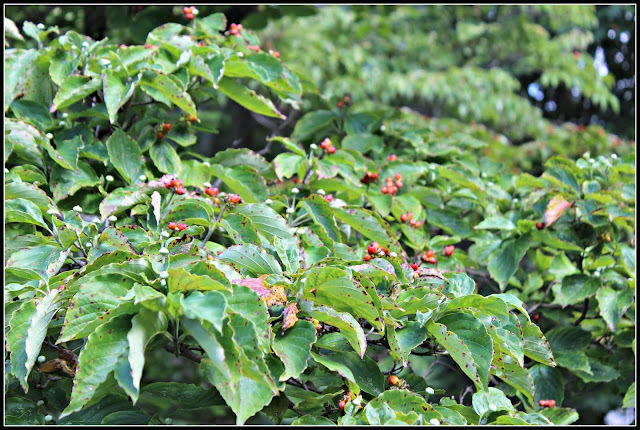 The dogwood berries are turning their lovely shades of red. All to entice the squirrels that seem to enjoy them immensely. The birds will have their chance to enjoy a few as well. 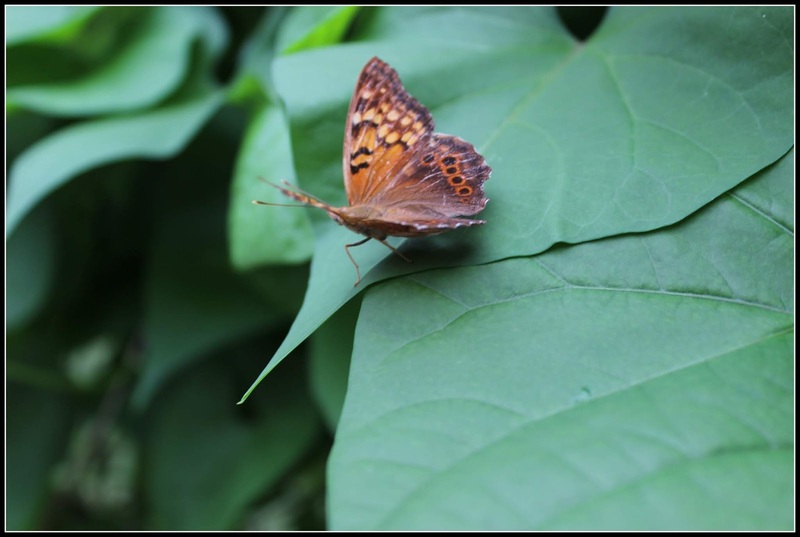 Watching nature through the years reminds me that they know when seasons are changing. It also tells me they know when a storm is brewing. Very few birds are busy in our garden today. Maybe they are seeking shelter where the winds will not harm them. I hope if you are in the path of the storms that are coming you are prepared as best you can. The morning glory has yet to bloom and now I believe it probably won't! 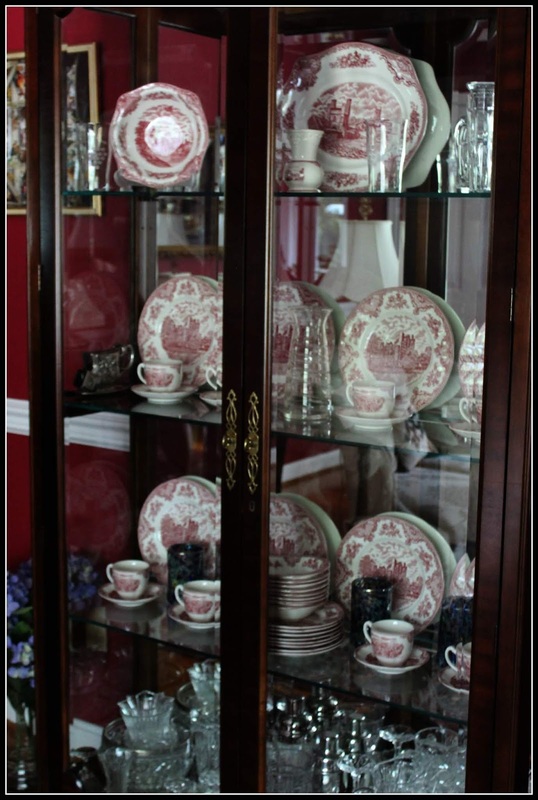 Most of you reading share my love of dishes and today Grayden and I put the Old Britain Castle dishes in the china cabinet and put the Friendly Village dishes in the cabinet in the kitchen for daily use. The Hearts and Flower dishes are stored in the server. The change of seasons gets me in a nesting mood. I realize there are more important issues in our lives, but these little things make me happy. 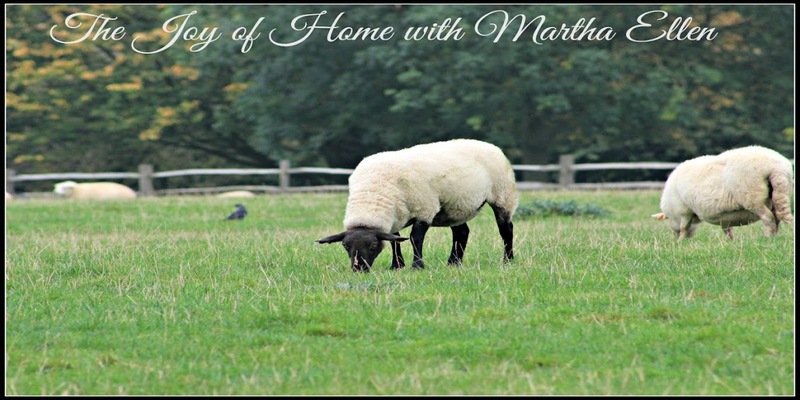 Lovely photos, Martha Ellen. 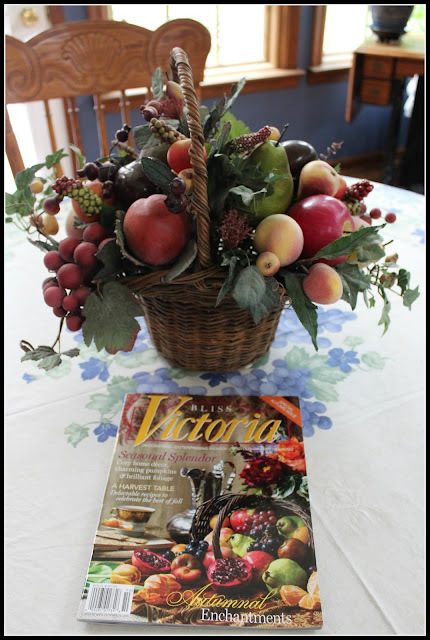 And your basket of fruit matches the Victoria cover so well! You are getting me in the mood to start decorating for Autumn early. I usually wait until the autumnal equinox. The sun finally made an appearance this afternoon after an absence of several days. I hope you don't get inundated this weekend by the remnants of Florence! 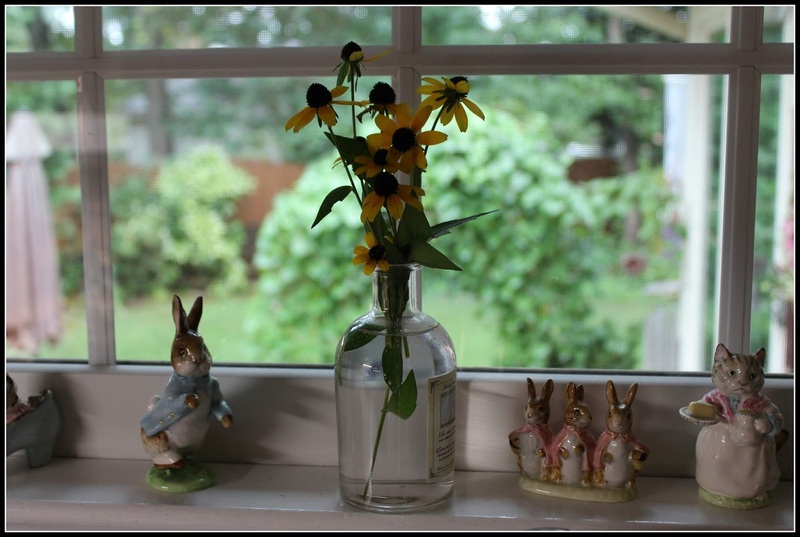 Sometimes puttering in the house is just the thing and especially when the weather news is so rotten We have had a return to heat and humidity just when I thought it was over, too. Rats! Autumn Bliss! Autumn in your home and garden are just perfect, and you have shared some beautiful photos. Our weather, of late, has been very Autumnal in the worst sense with a cold, damp, wet, and windy fortnight, but the last two days have been those perfect Autumn days I love, and long for, so much; those days when you can simply smell Autumn in the air, and everything glows in mellow Autumn light. However, I am ready for an Indian Summer in October. Stay safe, my friend, in the coming days of Florence! 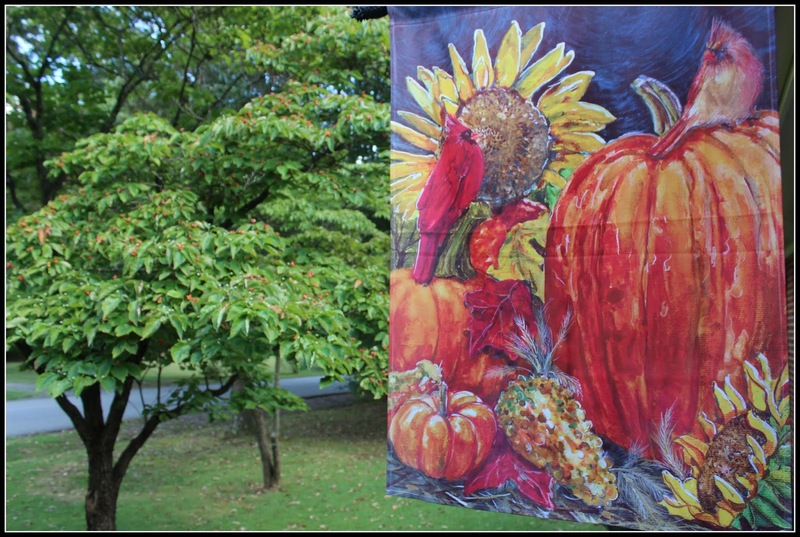 Deb, I love the picture you paint of the perfect Autumn days. Hopefully we both can look forward to many of those days ahead and then an Indian Summer for October. The storm is far to our south. We are expecting winds and rain, but nothing like the force that our neighbors will endure. Like you I am ever thankful for a roof over my head and food aplenty. We are indeed blessed. 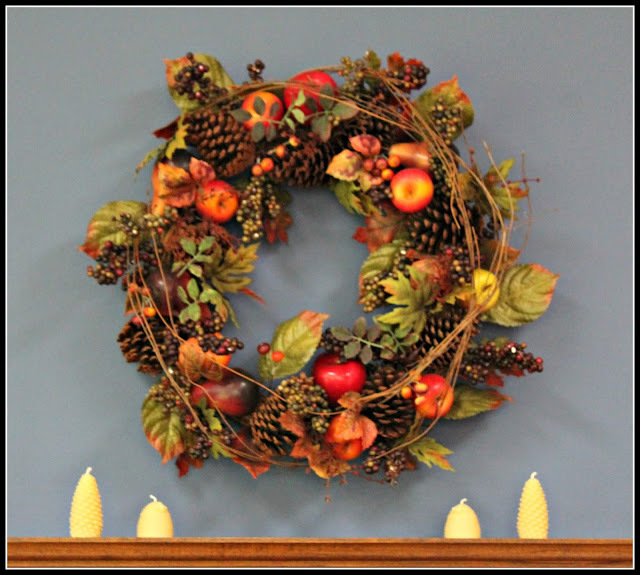 It as a joy to have a glimpse of your beautiful home and admire your seasonal decor. Hope this terrible storm is not coming your way. to your home to bring you Joy. It's good to appreciate our Blessings. and it's much colder especially at night. I will make some soup today it is a day for soup. Cooler temperatures here and your lovely post have combined to put me in the mood for all things fall. Of course, we must wait a bit longer, but signs of fall are popping up everywhere. Our black gums are already sporting lots of brilliantly colored leaves, also. I love your dishes! I've been fluffing or nesting too -- something to do while we wait for Florence. Its still hot and humid though today there is the storm preview breeze that so far is just lovely and feels a little like fall. 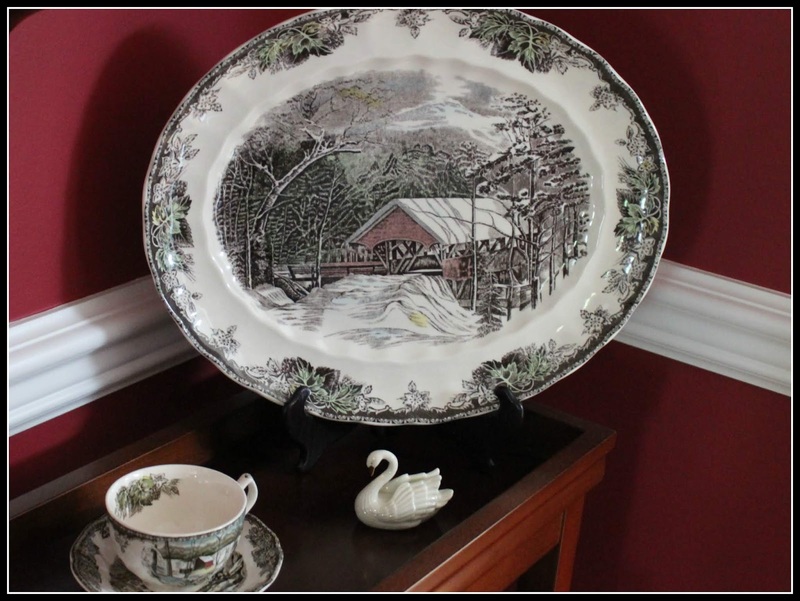 I have those castle dishes but gave away my Johnson Old mill dishes which are similar to your Friendly Village. I especially liked using them in the fall for the colors. I remember when we got married I picked out the Old Mill and my friend picked out Friendly Village, which has remained popular through the years. Old Mill not so much. Dotsie, I love all the old Johnson Brothers patterns! The Old Mill pattern is lovely. I love that quote Autumn, the year’s, last loveliest smile! I’m getting the autumn bug and want to start putting things out but I’m resisting. I brought up my fall tubs but haven’t put things out yet. I love autumn it’s just that the next step is winter so I always hate rushing. I like that bowl of fruit- did you put your own cinnamon into the oranges? Love the dishes in the china cabinet. 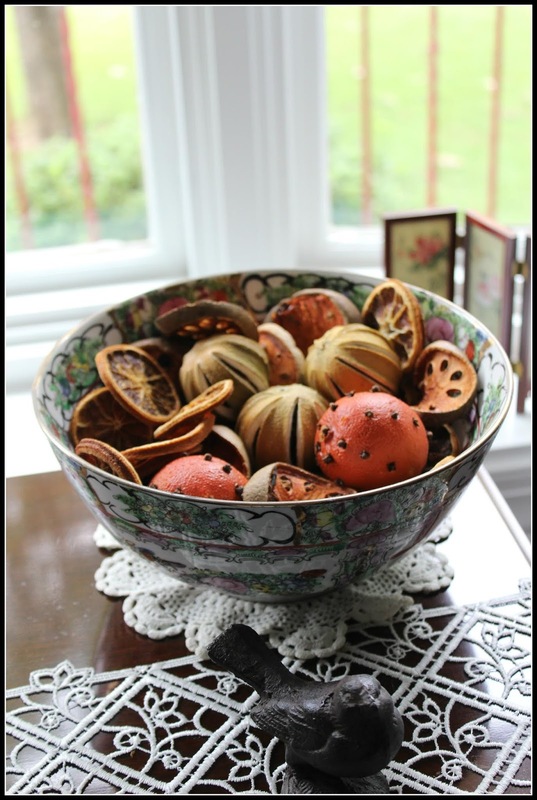 Liz, I bought the dried oranges studded with cloves years ago in Williamburg. I store them from year to year and they are lasting. Years ago I made my own, but they molded in storage! I think most of my friends to the north don't look forward to Autumn as winter comes close on its heels. Autumn is such a beautiful time of year and I welcome it. I love your dishes. Time for me to get rid of odds and ends dishes and just have two sets. Love your dining room and I am getting the urge to paint mine a red color. Love it! Autumn is my favorite season too. Your decorations are beautiful. We have warm temperatures here in Colorado, but Autumn color has arrived in the high elevations. 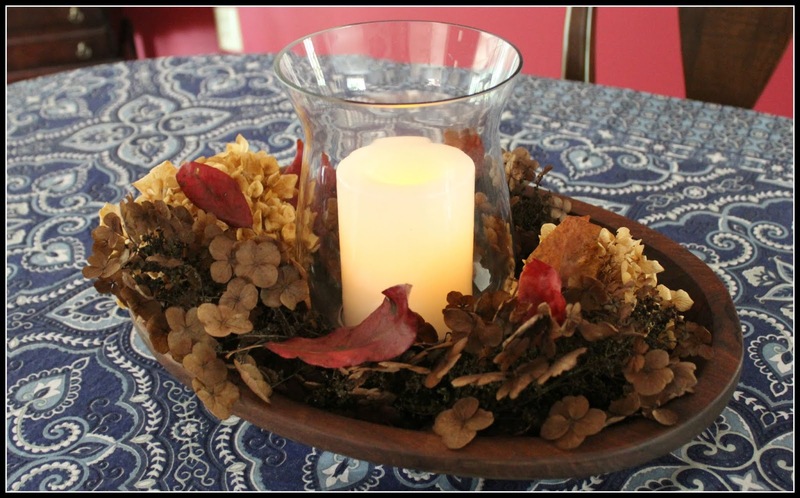 Everything in this post makes me think of Fall! It's too bad the weather doesn't reflect it with it being in the 90's and humid. Today wasn't too hot and humid though. Maybe it will cool down soon! Happy Monday!